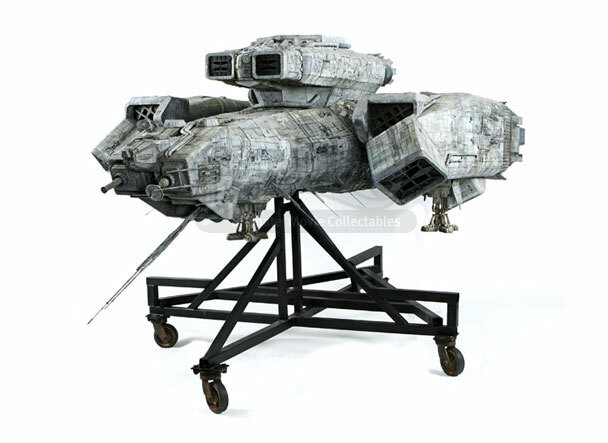 The Nostromo is the commercial starship that Dallas, Ripley, and the rest of the crew traveled on in Ridley Scott’s science fiction masterpiece, ALIEN. 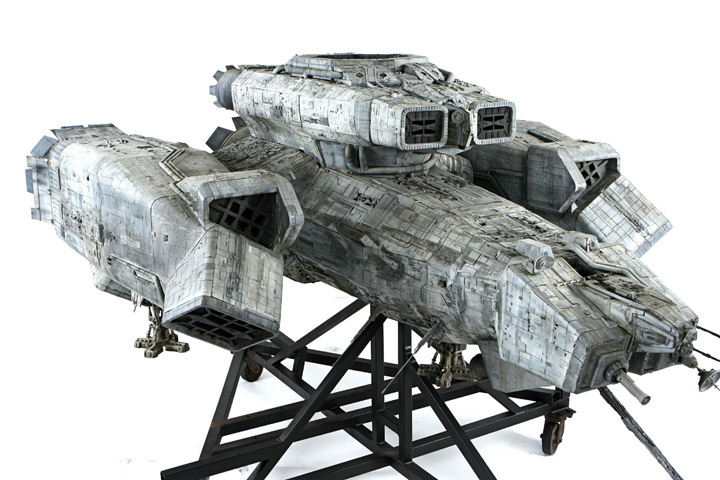 The ship was realize as several different scale model miniatures in the film, including a 12” version, a 4 foot version, and a 7 foot version. 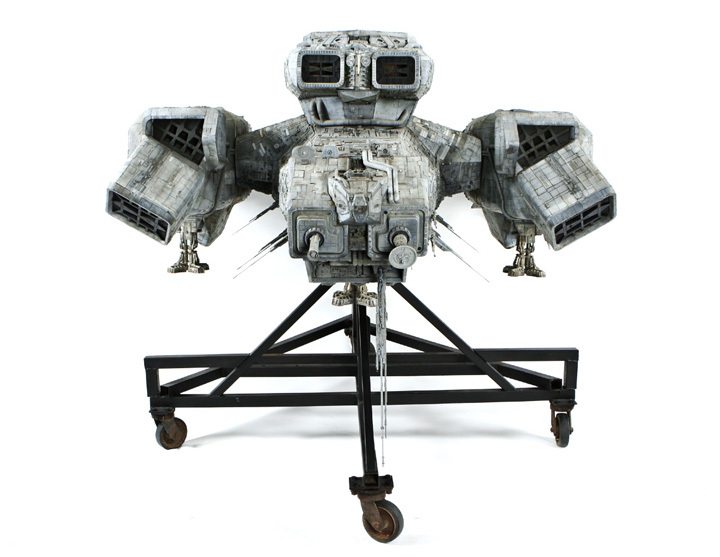 The 7 foot version was the main model used in production, it sees the most screen time in the film, and was the first model constructed during production. 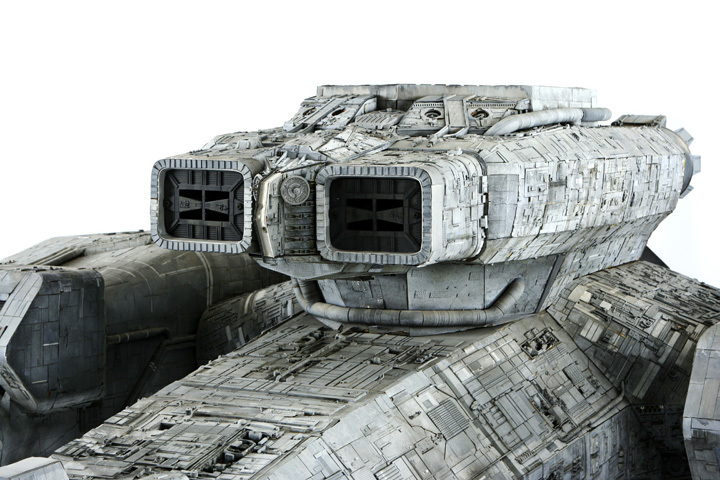 The initial concept of the Nostromo was created by renowned artist Ron Cobb. 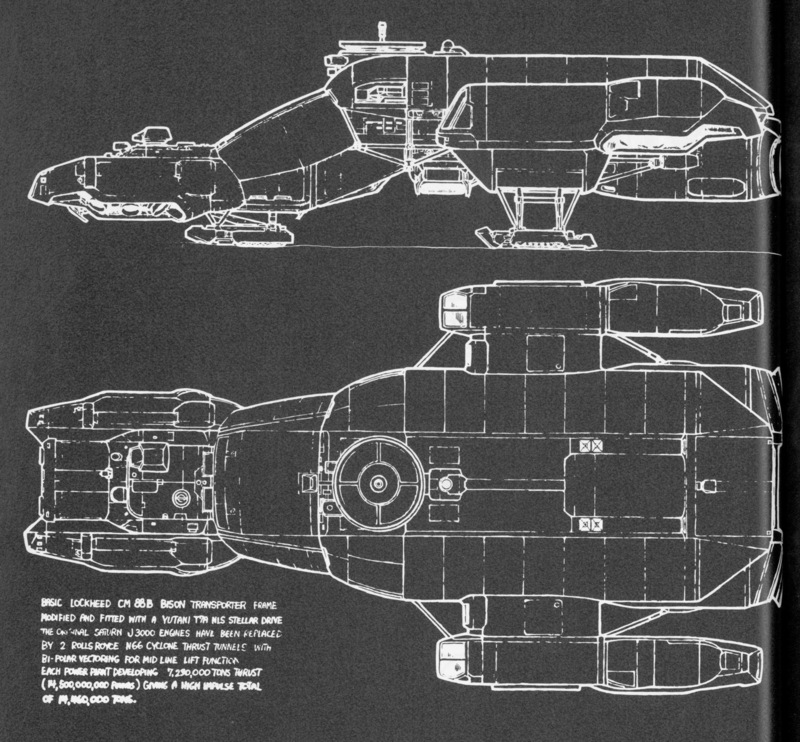 Beginning with this sketch, the model of the Nostromo was constructed by a team of British special effects artists led by Brian Johnson, under direction from Ridley Scott. 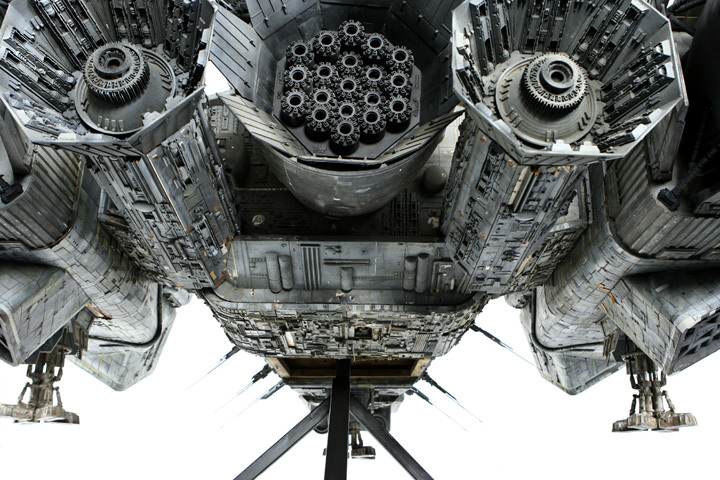 “I used to go and see Ridley with a scale model, a 6” model, and say ‘This is how we think it should look.’ And he’d say ‘let’s add this…’, and he would get a sketch pad out and he would sketch all these aerials and things like that. ‘Let’s put those on there, and let’s put this and let’s add that…’ And that’s what we did with this thing. It gradually grew, and grew, and got heavier, and heavier”, remembers Johnson. 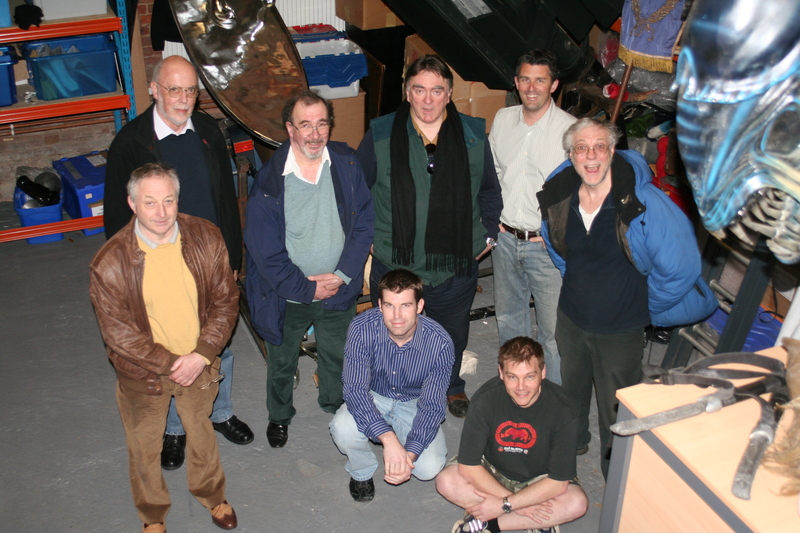 The rest of the team involved in the construction of the Nostromo included Nick Allder, Brian Eke, Martin Bower, Martin Gant, Simon Deering, Ron Hone, Bill Pearson, John Pakenham, Jon Sornsen, Phil Knowles, Dennis Lowe, Phil Rae, John Hatt, Roger Nichols, Neil Swan, Guy Hudson, and Andrew Kelly. 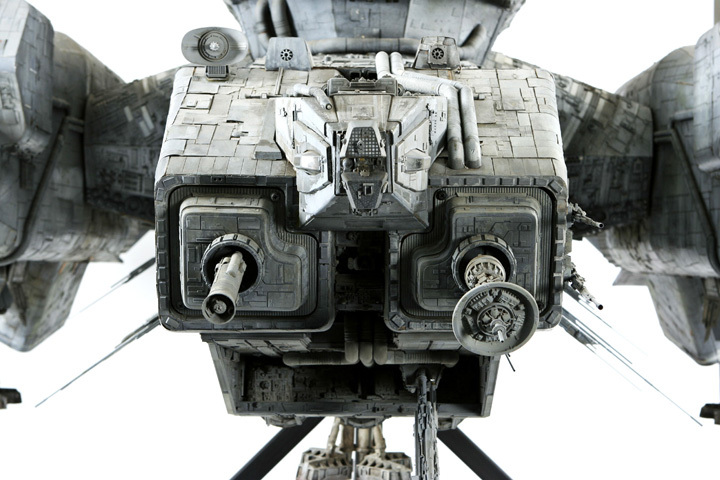 The Nostromo was constructed with a wooden structure over a steel frame that could be mounted from various angles, depending on the placement of the camera for a given shot. The surface is made of several different kinds of wood, including hand carved blocks that make up the contours, and luan for the flat surfaces. From here, an initial surface layer of sheet-plastic was laid down with a rubber cement. Additional layers of detailing where applied using chloroform (which melts the plastic slightly) as a glue, and polystyrene cement in some cases. 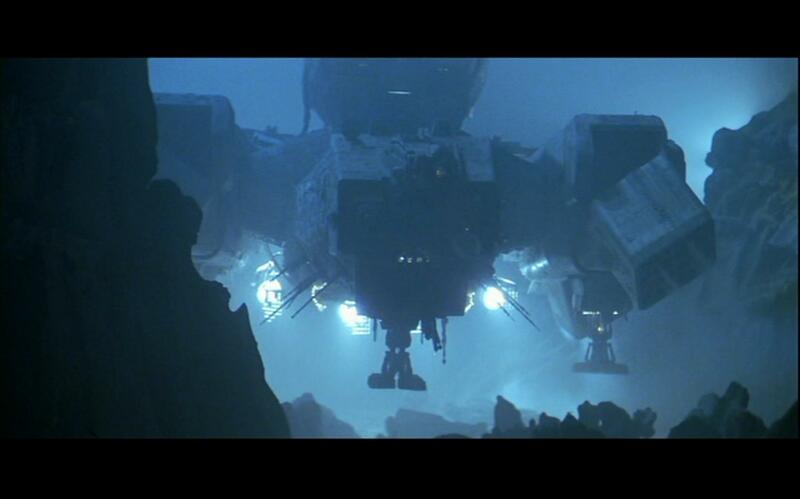 The Nostromo went through a number of design changes during construction. The first paintjob was applied in a bright yellow color, in keeping with the “truckers in space” theme that Ridley Scott envisioned for the film. 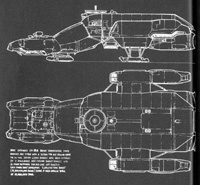 The yellow color was later abandoned for a more traditional spaceship color – grey. The visual effects sequences for ALIEN were shot at Bray Studios in 1978. After production wrapped, the majority of the assets from the film were sent to FOX Studios in Los Angeles. FOX subsequently discarded many of the ALIEN assets, and some were given a second life when they were used for a Halloween show in Burbank, CA. Due to its significant size, the Nostromo spent the next two decades of its life outdoors, sheltered from the elements by plastic tarps. During this time period it suffered some damage from the elements – rain and sun have taken their toll over the years. 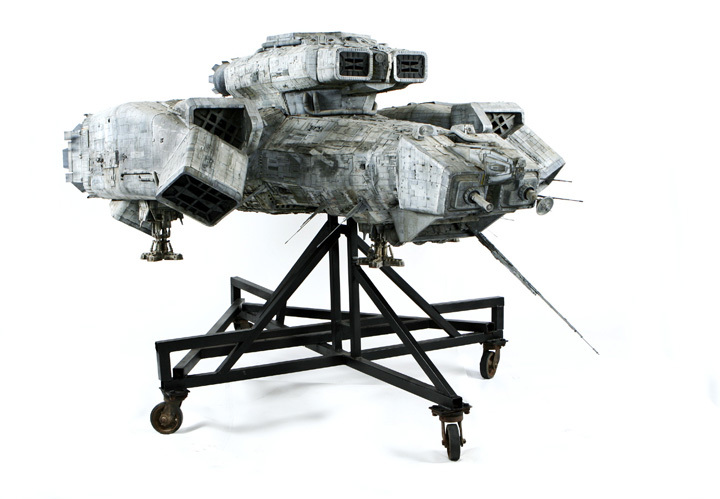 Around 2000, the Nostromo was moved to the shop of renowned LA effects company KNB where it was well looked after by Greg Nicotero and Howard Berger with a view to begin restoration. 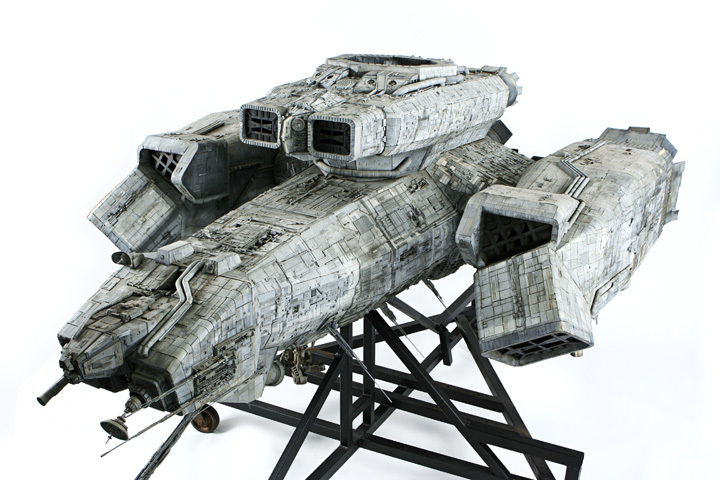 The Prop Store of London acquired the Nostromo in 2007, with a plan to stabilize the model and give it a light cosmetic restoration, in order to bring the model back to its former glory. The majority of the structure was intact, and with the model were bags of pieces that had fallen or broken off over the years. In April 2009 the Nostromo was moved again, this time to Grant McCune Design, where the restoration is currently taking place. Grant McCune has been in the same facility since 1976, when he led the model team through the groundbreaking effects on Star Wars. The facility later housed Apogee Effects, well-known for projects like Battlestar Galactica. 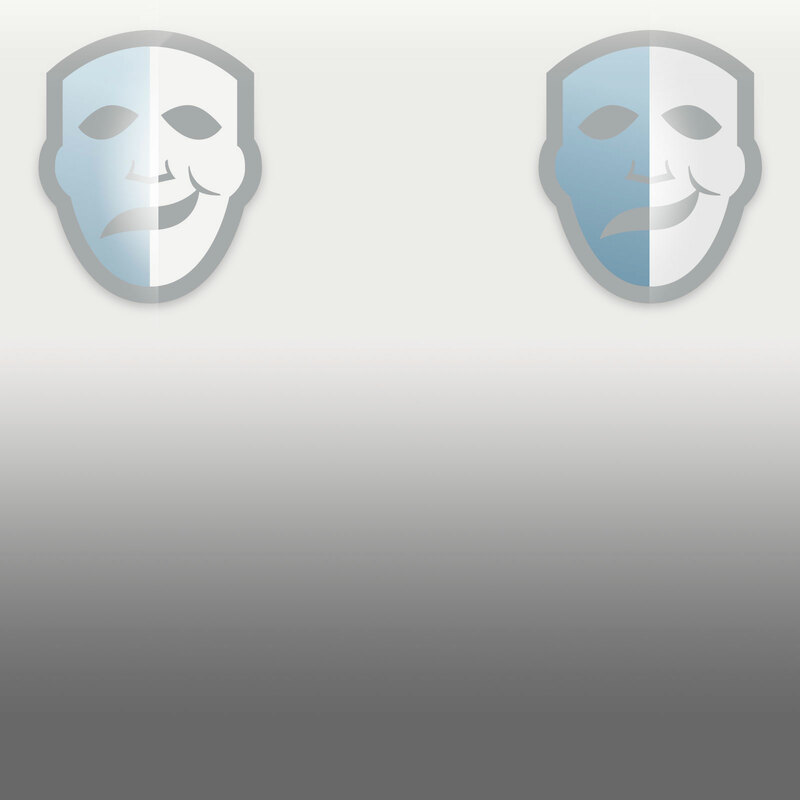 When Apogee disbanded, McCune started GMD out of the same space. 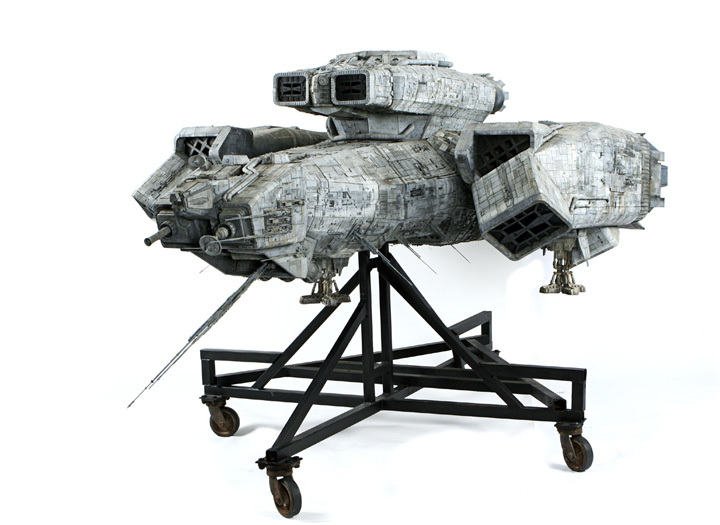 The team restoring the Nostromo is being lead by Monty Shook and Jack Ejourian, who have both been with the company for over a decade, and designed and built miniatures for dozens of major Hollywood films. Avid film fans themselves, Monty and Jack are excited to be working on restoring this historic model miniature. The restoration will involve cleaning the model, stabilizing and repairing damage to the structure and surface, identifying and re-attaching broken components (a significant puzzle), replacing missing surface panels, and re-creating missing components and detailing. Every effort is being taken to restore the model as faithfully as possible to the original. In many cases, detailing pieces repeat themselves throughout the ship’s surface. In most cases there is at least one example of the detail part present, so that piece can be cast to create exact copies of the original detailing. In cases where there is no example to cast, the piece will be created from scratch using the best reference material available. Knowing that reference material would be key to the project, Prop Store reached out to the original team of builders, who were kind enough to give us access to their personal photographic archives. 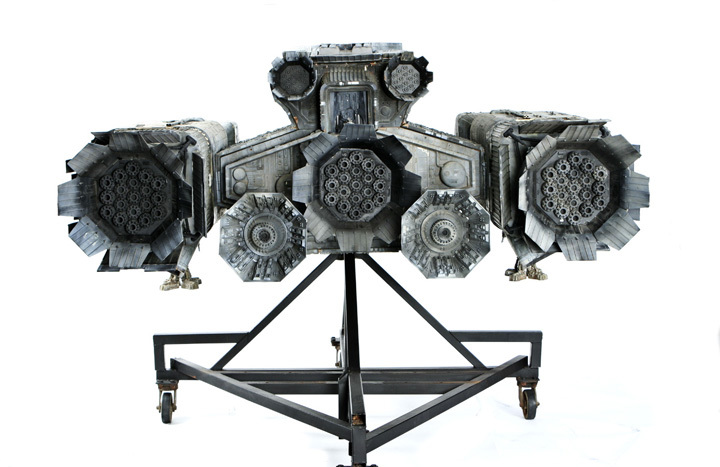 We have located hundreds of reference photographs taken in the ALIEN special effects workshops three decades ago, and these provide the blueprint for the restoration.